Caption slip reads: "Photographer: Emery. Date: 1952-04-04. Reporter: Phister to rw. Assignment: Baby born after father's death in Korea. 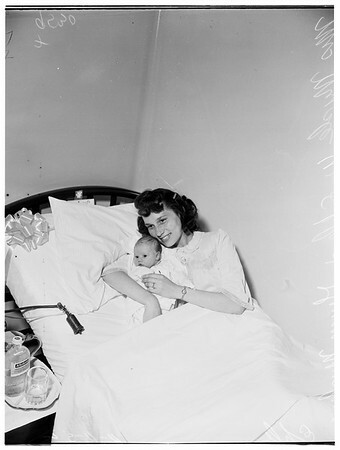 96, 24, 25: Baby Ginger Myrlene Ehle, 2 days old, in arms of mother Mrs. Myrle W. Ehle, 323 Janice St., Long Beach, at St. Mary's Hospital, Long Beach. Mother's given name is Cleo.